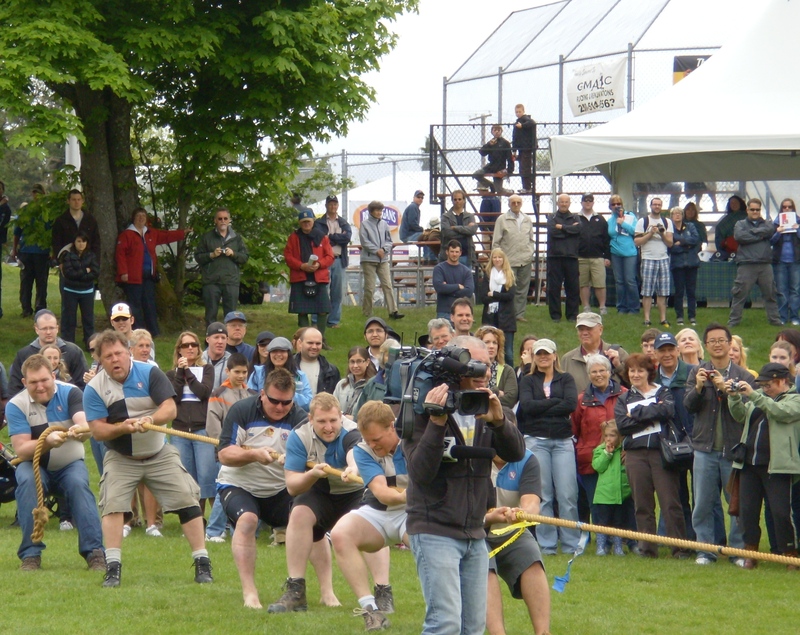 After experiencing the 2011 Victoria Highland Games, my expectations for 2012 were raised, partly because I now have a great camera to take amazing photos. 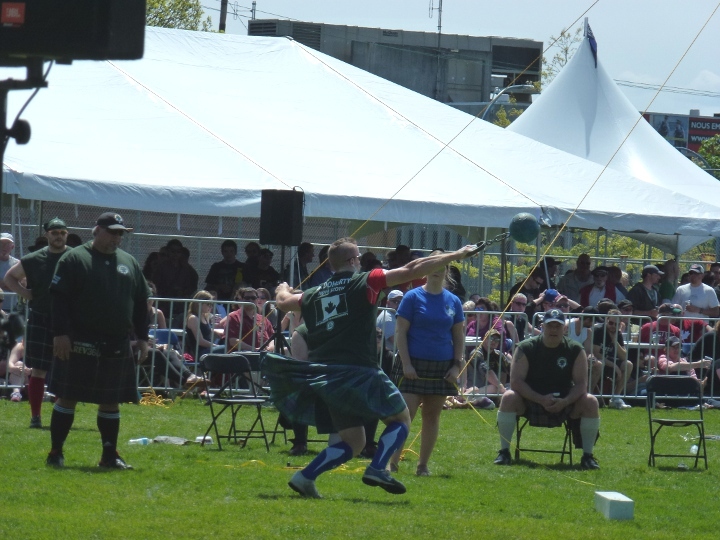 Still, with the warm sunny weather and not a cloud in the sky I was excited to see what the 2012 Victoria Highland Games & Celtic Festival had to offer. After walking through the front entrance to Topaz Park, I snapped a few quick photos of the pipe band practicing in one of the lower fields and joined the large crowd waiting to see the sheepdog trials. Being a city girl all my life, I’d never seen a sheep being sheared up close, but the quick and effective way that the woman handled the sheep and sheared all the wool off with no pain at all, seemingly, to the sheep was impressive. Next, I watched the tug-of-war competition between two different teams and cheered along with the crowd when the team on the right won. From there, I snapped a few photos in quick succession of the different vendors and clans that attended the Highland Games this year. Standing in front of Clans Cameron and MacLaren, I could see some of the vendors such as Freedom Kilts and Labyrinth Leathercraft, the name which invokes for me images of the Greek myth of Minotaur. Standing with the crowd and being able to see the distance weight toss up close and personal through the amazing zoom of the camera lens was awesome. It was the first time that I’d ever been able to capture live action shots so clearly, making the experience of watching the Heavy Events that much more memorable. I was even able to catch an Irish step dancing performance as well as a pipe band performance on the main stage over the heads of the crowd. Both performances as well as that of a music performance on the Bard & Banker stage were made that much more special because of the ability to see every aspect of each performance up close and personal through the camera lens. Lastly, I was able to capture some great shots of the sheepdog herding trials; snapping photos of the dog in motion as he herded the sheep around makeshift fences in a circle. 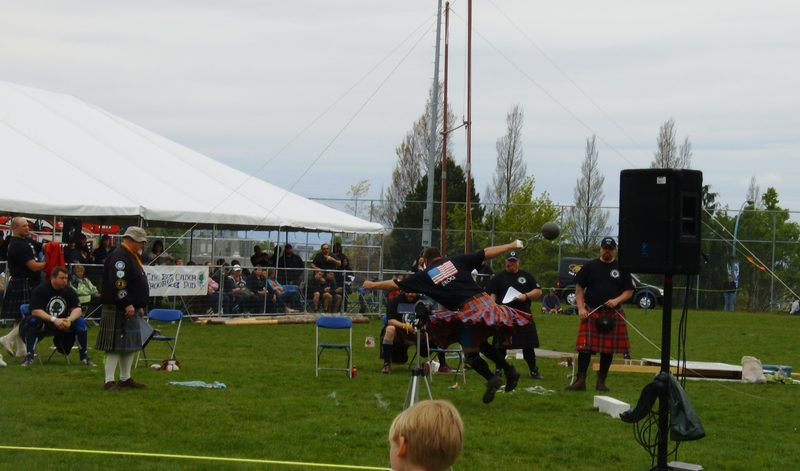 What are my expectations for next year’s Highland Games & Celtic Festival? Well, it would be fantastic to finally see the caber toss, which I’ve never gotten a chance to see, as well as the braemar stone competition. Who knows, maybe I’ll even have the guts to try some haggis! 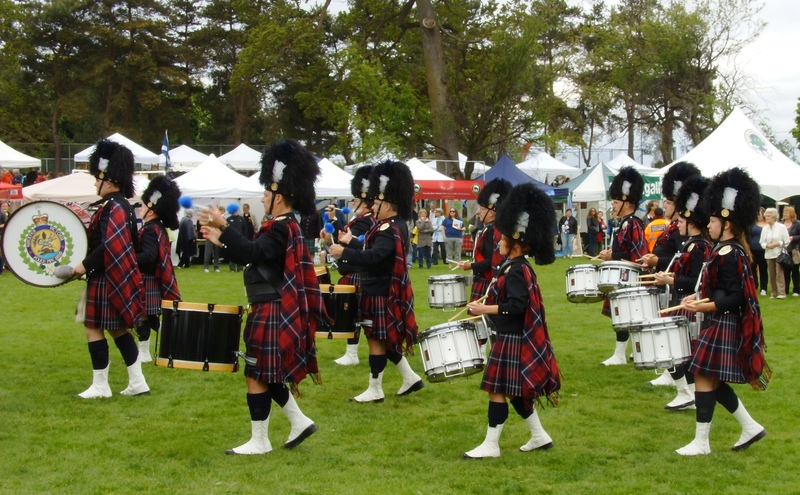 If you’ve never been to the Victoria Highland Games & Celtic Festival, I definitely recommend it! Though it was cloudy and windy, my first time at the Victoria Highland Games and Celtic Festival at Topaz Park was definitely interesting and a lot of fun. Woodhaven Studios had many beautiful Celtic knots on display, including a gorgeous triangle one with a heart in the middle. 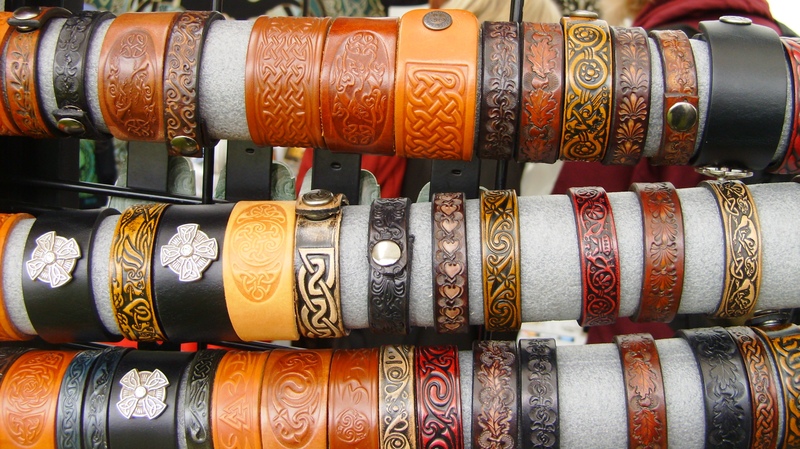 Another vendor called Wandering Arms had a large display of leather Celtic bracelets that were beautiful. My partner and I wandered around looking at several of the vendors and even some of the traditional Scottish food such as the Scottish meat pie and mushy peas. Since we got to the festival just after lunch, we didn’t actually eat any of the food, but I’d be open to trying it in the future. Brewing Company International Heavy Events featuring the open weight competition. The weights were in four different weight classes, 14 lbs, 28lbs, 42lbs and 56 lbs. The competitors were all men, some from the US and a few Canadians in there as well, from Nova Scotia and Ontario. Although I couldn’t quite pinpoint what weight they were currently competing with as we joined the competition in the middle, some of the tosses were pretty impressive. In fact, the longest toss we saw with the hammer made it pass 42 inches. It was the longest distance we had seen the weights being thrown by far and all the men competing had had at least five to ten years of professional experience and they all had awards to their names. 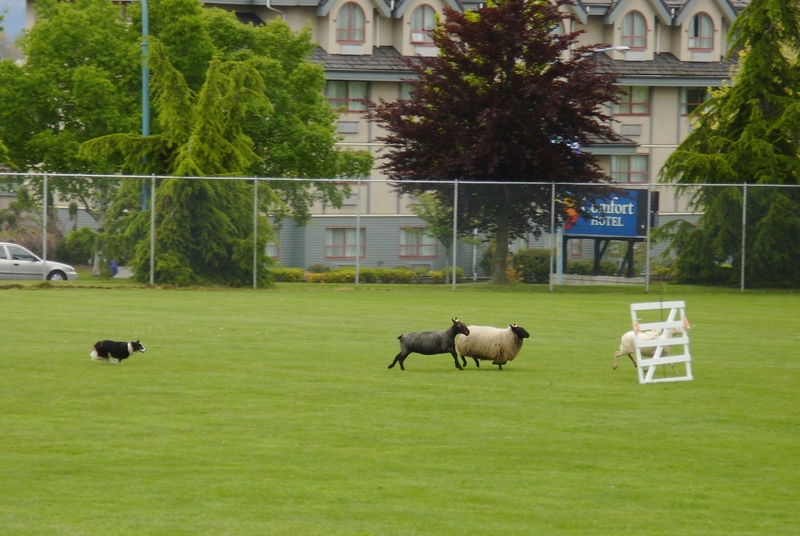 Next, we took in Run 2 of the sheepdog herding trials at the Lower Field in the park. Given that my partner and I had both been raised in big cities, sheepdogs herding sheep was something we had ever seen in movies. The sheepdogs were black and white in variety, close to the Belgian sheepdog breed, although I’m not 100% sure and they were tested on how fast and how orderly they herded three sheep around the fence posts that were set up. Anytime one of the sheep was out of line, the dog was quick to remind it who was in charge and chase it back into the line. Highland Games and Celtic Festivals as well as famous Scots who played a part in founding Canada; including Simon Fraser (whom my alma mater is named after), the judge Sir Matthew Begbie, BC’s first Supreme Court Judge and even more locally, the Dunsmuir family, father Robert who built Craigdarroch Castle and son James who built Hatley Castle years later. It was definitely interesting to see more of that part of Canadian history as well as history of Scottish Canadians, as we had only ever touched upon Scottish Canadians and fur traders who were involved in the founding of the Hudson’s Bay Company in school. Afterwards, we took in a tug-of-war between two teams of men, one of which had to remove their cleats in case of unfair advantage over the other group while they tried to gain traction in the mud. We also took in some of the bagpipers practicing behind the main stage, just moments before the Greater Victoria Police Pipe Band performance in the Middle field. The performance was amazing and very cool, as the only pipe band performances I’ve seen have been performed during convocation ceremonies at SFU. It was an interesting mix of Scottish and Celtic culture, sports, performing arts and food and it is definitely a yearly event I plan on putting in my calendar for years to come. And maybe next year, I will attend either earlier or stay later to see the haggis hurling event!